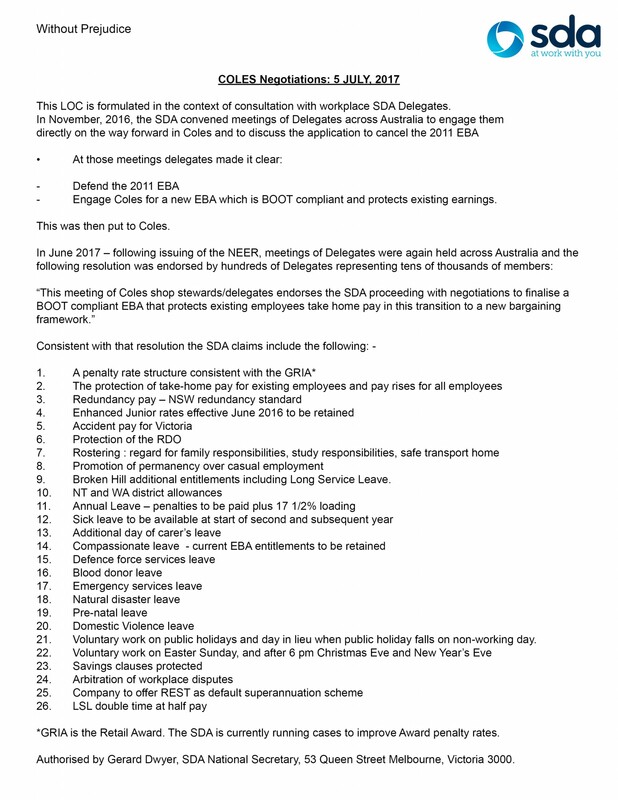 The SDA has held meetings with Coles for a new agreement over the last 2 days. We have now formally responded to the Coles draft for a new agreement which is an award based platform. This delivers on SDA claims for higher penalty rates and other compliance issues. However, the SDA remains committed to ensuring that existing workers take home pay is protected, that all workers receive pay increases and that we retain the hard won union conditions we have achieved in over 20 years of bargaining with Coles. Higher Casual penalty rates which we are also pursuing for all retail workers at the Fair Work Commission. Retention of higher SDA-won junior rates. Maintaining superior SDA public holiday conditions. You see our log of claims here. Our meetings continue next week. Remember, no proposed Coles Agreement can be put in place without a vote of all employees. You will have the final say when it comes to any new Coles Agreement. We will continue to update all members throughout negotiations.